Open shelving for easy storage of media center components, modern bookshelves or display. 5 wood combinations available. Pictured in Walnut with Tiger Maple. Entry storage cabinet with sliding door. Modern Bookshelves, Accent Cabinet, Bed Side Table with small bookcase. 5 wood combinations available. Pictured in Walnut with Tiger Maple. Small, narrow end tables for your bedside tables, accent tables and perfect for small space decorating. Hand-cut dovetail drawers. 5 wood combinations available. Pictured in Tiger Maple. Narrow sofa console cabinet for storage, display or bookcase. 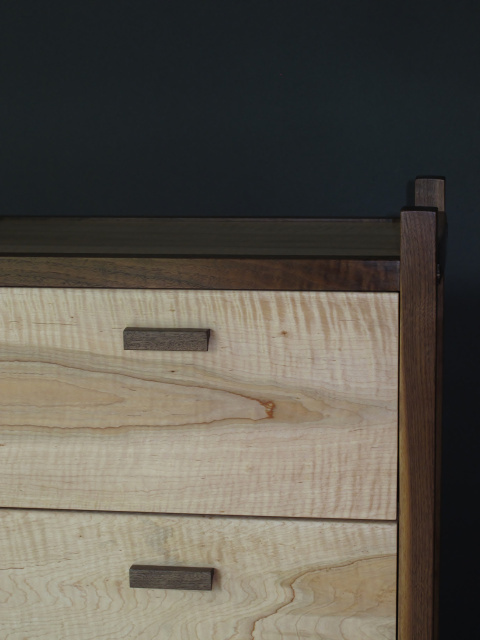 Hand-cut dovetail drawers. 5 wood combinations available. Pictured in Tiger Maple with Walnut. MidCentury Modern Media Storage Cabinet. Solid wood furniture Entertainment center, Bookshelves, unique display and media storage. 5 wood combinations available. Pictured in Walnut with Tiger Maple. MidCentury Modern Coffee Table with storage, inset shelf. Small coffee table with artistic Butterfly Key Inlays and Ebony accents. 5 wood combinations available. Pictured in Walnut. 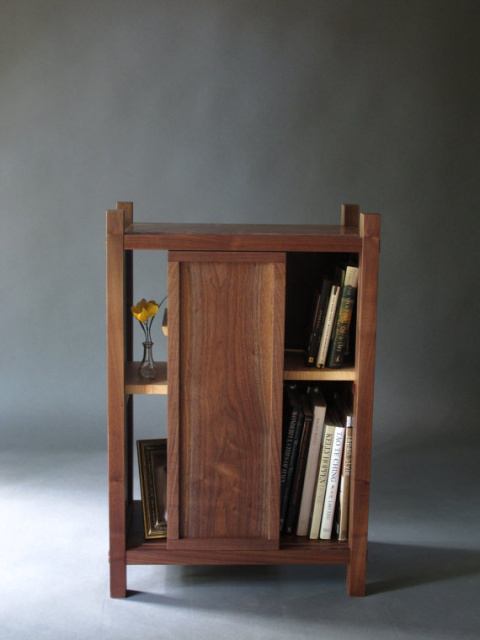 Modern wood bookcase & display cabinet. Narrow console features staggered shelving and an artfully lifted top. 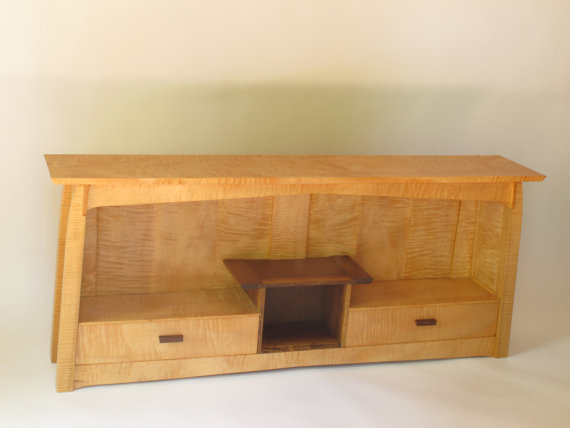 Sofa table, entry cabinet or buffet server. 5 wood combinations available. Pictured in Tiger Maple with Cherry. Narrow armoire cabinet. 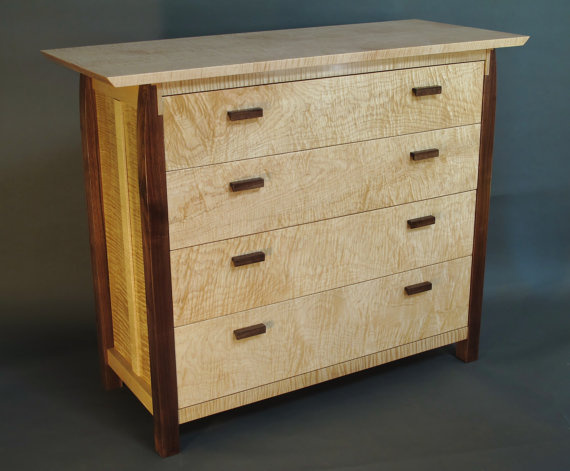 Solid Wood Furniture for a pantry cabinet, linen armoire, bar cabinet or tall bedroom armoire. 5 wood combinations available. Pictured in Cherry with Tiger Maple. Cherry accent cabinet with beautiful cuves and interesting interior shelving. Entry Cabinet, Bar Cabinet or Side Cabinet. 3 wood combinations available. 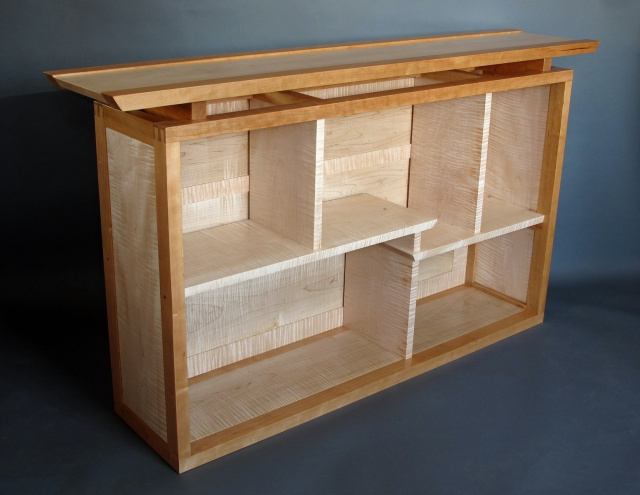 Pictured in Cherry with Tiger Maple interior shelves. Small, narrow end table for your bed side table, accent table and perfect for small space decorating. Hand-cut dovetail drawers. 5 wood combinations available. Pictured in Tiger Maple with Cherry.